A user-friendly interface provides you with control over your business at your fingertips. Get a snapshot of your fulfillment operation and resolve alerts quickly and easily. Receive alerts for orders that are held due to carrier issues or business logic. See the status of inbound and outbound shipments in real time. View inventory by location, unit or status. View your business by region or globally through a single web interface. Set warning thresholds and receive alerts when items like inventory levels or backorders fall out of line. Keep your team and stakeholders informed using business reports and access detailed activity history logs for deeper analysis. Subscribe to recurring business reports and deliver them directly into your team’s inboxes. Export data in common file formats like CSV or Excel to upload into other systems for further analysis. 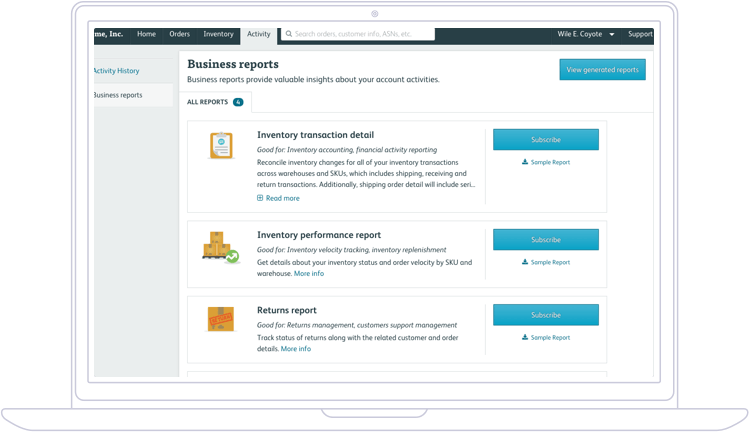 Access an archive of your reports to review past performance and inventory snapshots from specifics points in time. Filter and navigate historical order, receiving and inventory activity within your account at any time. Access a detailed history of almost every type of transaction processed through The Shipwire Platform, including claims, adjustments and payments. Easily navigate all closed, current and pending returns to trigger internal workflows like product exchanges. Take control of your supply chain with insightful dashboards and flexible reporting.